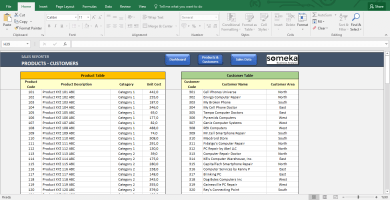 Professionally designed Purchase Order Template in Excel. Export to PDF, Ready-to-print. Save time with product/service database. Record your past orders. Purchase Order (PO) is a common type of form used between trading companies in daily business life cycle. This is generally prepared by the companies who wants to purchase specific items from the provider. When the seller accepts the purchase order, it becomes a binding agreement between two parties. 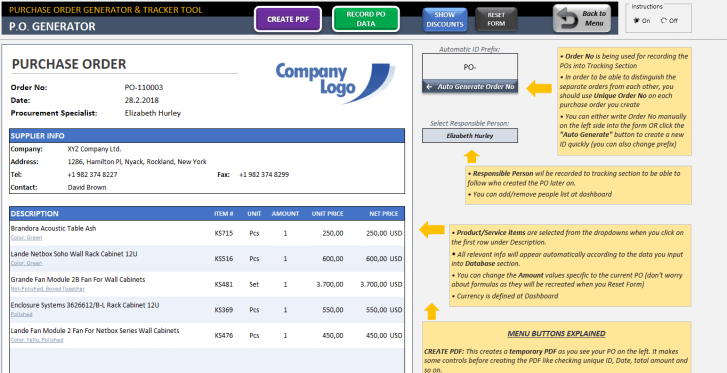 Our Purchase Order Template is developed to make this process faster and easier. 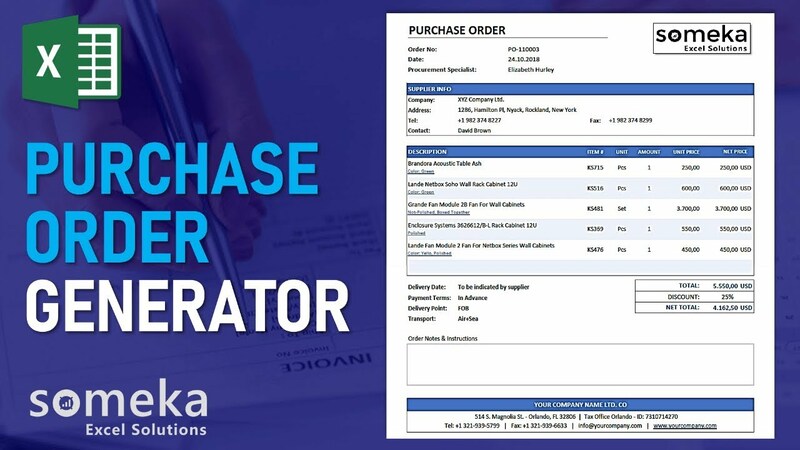 There are certain elements to be included in a formal purchase order form such as PO number, item description, units, prices, terms, date and so on. 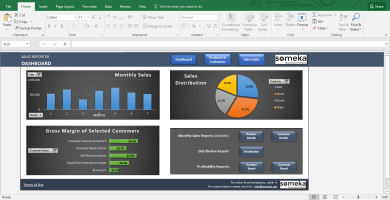 Most companies use Excel spreadsheets to prepare purchase orders. But most of the time these are non-standard, missing crucial info and lacking sleek design which does not tally with the company brand image. 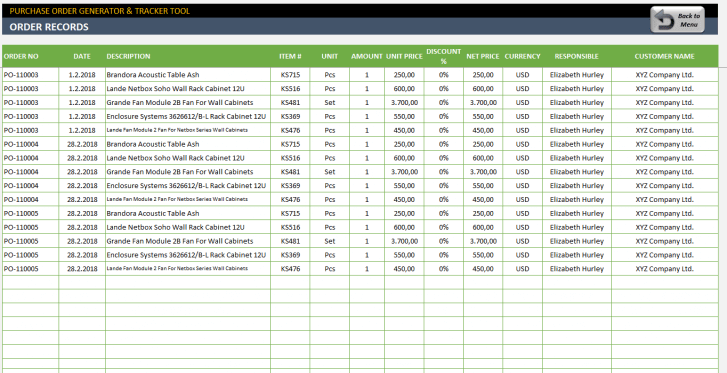 Besides, inputting info everytime from scratch is quite time consuming. 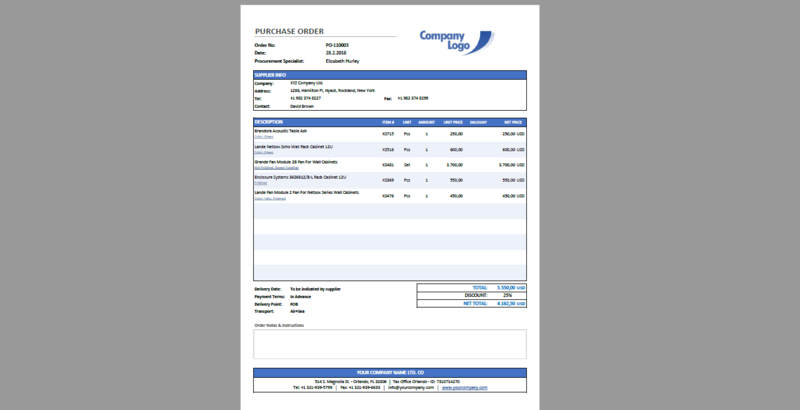 Why would I need this Purchase Order Template instead of simple ones? 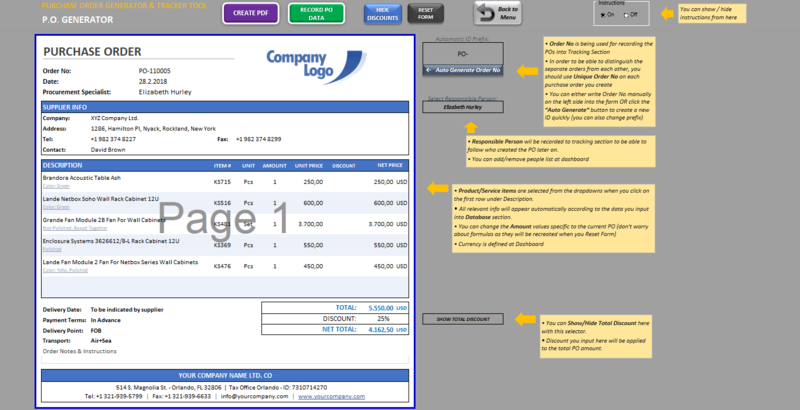 Professional and Well-Structured: A nice looking and neat purchase order improves your company image. It also includes all necessary elements so that you don’t forget anything. 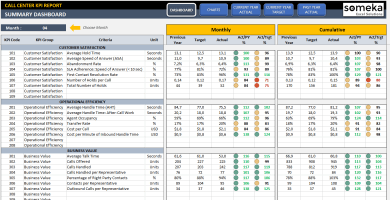 Save time preparing new POs: This tool has a separate database section for your products / services which lets you to “select” instead of making inputs every time. 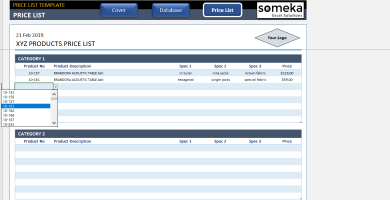 You just keep your database section updated and prepare new POs in 30 seconds! 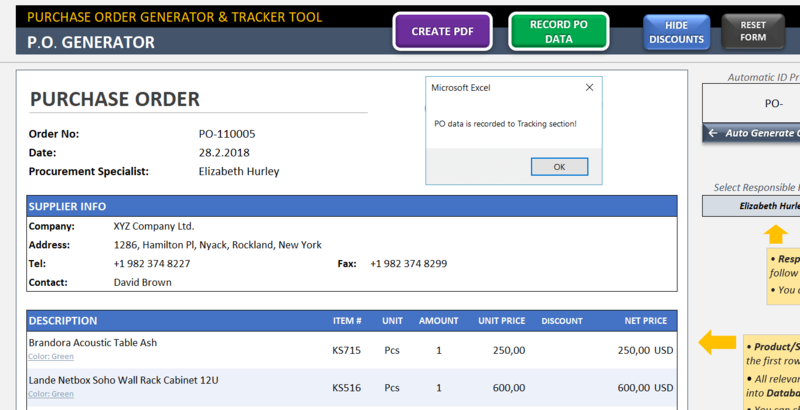 Record your past orders: Do you ever wonder what was the item you requested from XYZ supplier? 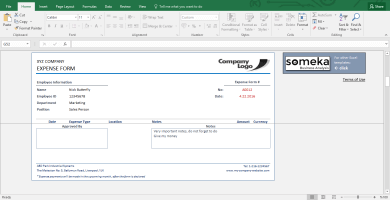 Instead of browsing through several documents, they are just recorded in this template. 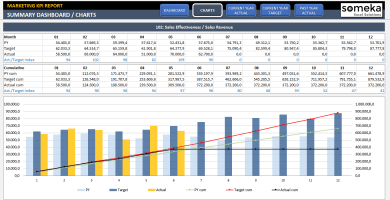 You can later on make analysis and create reports with this data. This template has many more handy features such as easy Export to PDF, Show / Hide discounts with a button, assigning and recording responsible person who created the PO and so on. All these features are super easy to use and come with on-sheet instructions. The flow is: Input the products/services you frequently order in the database > Create your POs in the generator section > Analyse your past POs in the Tracking section. 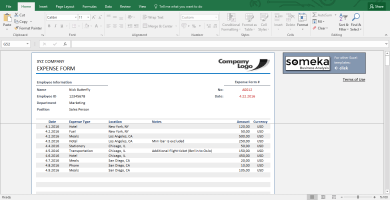 Create PDF: This creates a temporary PDF as you see your PO on Excel. 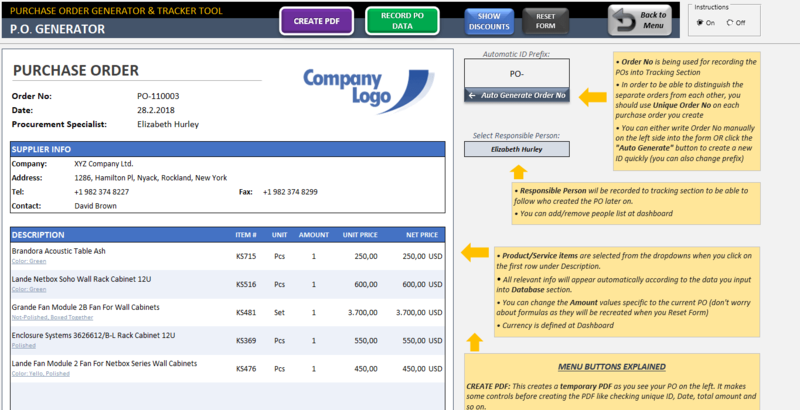 It makes some controls before creating the PDF like checking unique ID, Date, total amount and so on. When PDF is created don’t forget to save it to the relevant folder on your computer. Record PO Data: This sends the purchase order data to Tracking section so that you can analyse what / when / how did you create POs for certain providers. 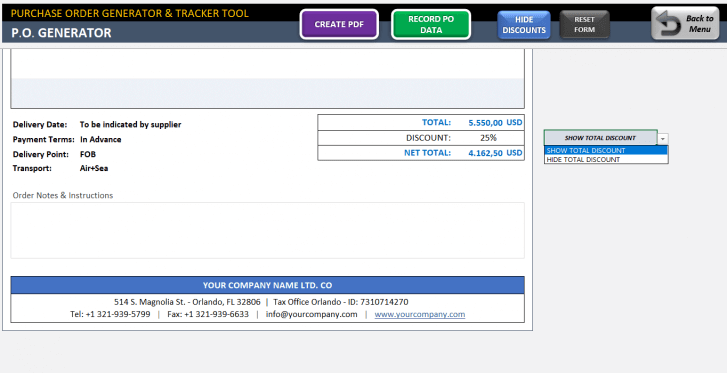 Reset Form: This button deletes all the existing information on the PO form, refreshes formulas and makes it ready for a new PO. Use with caution. Responsible Person: Responsible Person will be recorded to tracking section to be able to follow who created the PO later on. You can add/remove people list at Dashboard section. 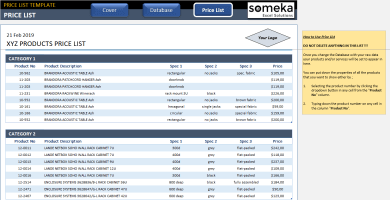 Products / Services Section: Product/Service items are selected from the dropdowns when you click on the first row under Description. 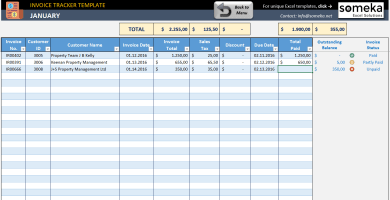 All relevant info will appear automatically according to the data you input into Database section. You can change the Amount values specific to the current PO (don’t worry about formulas as they will be recreated when you Reset Form). 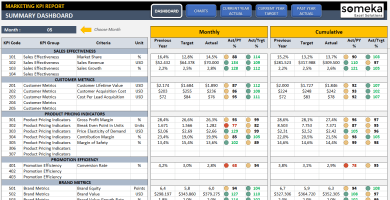 Currency is defined at Dashboard. 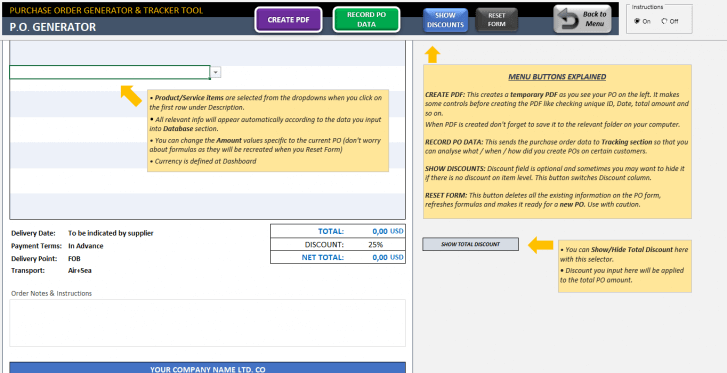 Show / Hide Total Discount Selector: You can Show or Hide Total Discount here with this selector shown below. 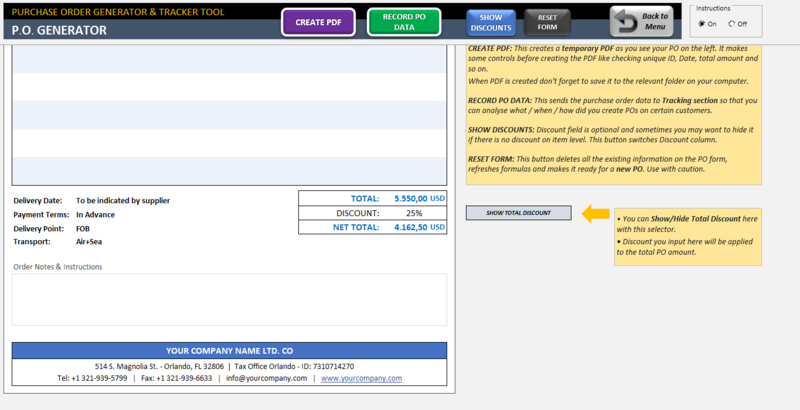 Discount you input here will be applied to the total PO amount. Order Notes & Instructions: This is a free text field in which you can write down the additional notes you want to deliver to the supplier. 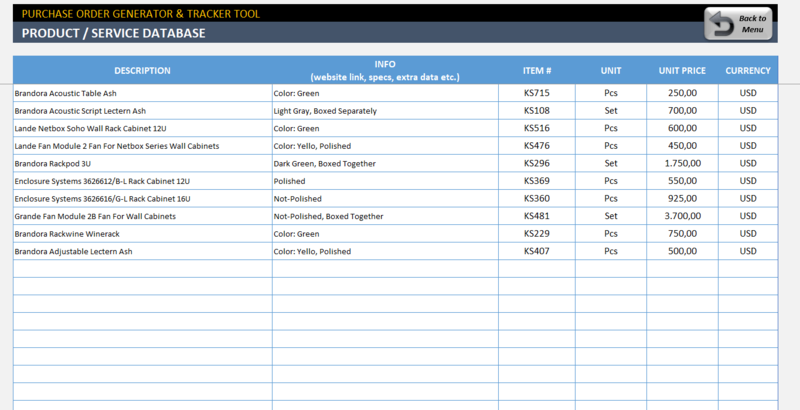 Description & Info: Description column is being used in the dropdowns at the PO form (as shown in the image below) In the Info column you can put any data for each item. If you put web links here, they will appear as clickable links in the PDF generated. 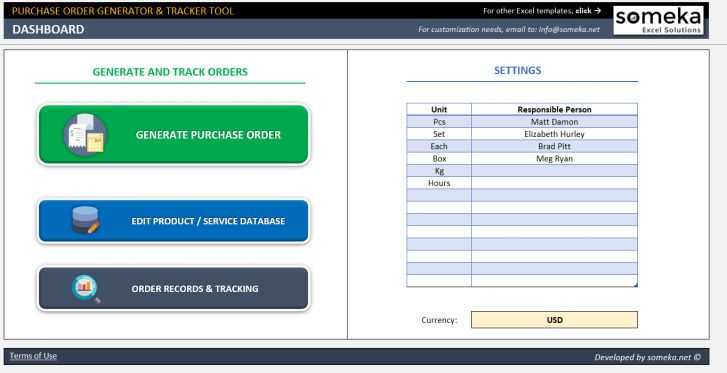 Item # – Unit – Unit Price – Currency: These info will appear automatically in your quotation when you select the relevant item while preparing your Purchase Order as shown below. A great time saver! This is really useful if you want to keep track of your POs, responsible person who created the PO, items you requested and so on. 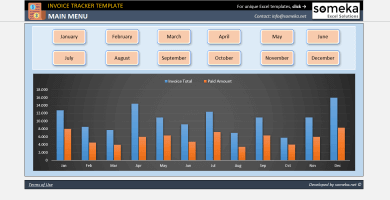 a wonderful excel template with a friendly fully support . 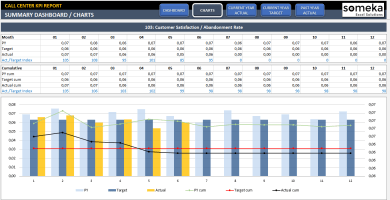 Customer Information should also have drop down facility to select the customer out of the multiple list. That’s a good idea! Thanks for the feedback. Actually, we did not want to increase the complexity and limited the selection feature only for products / services. 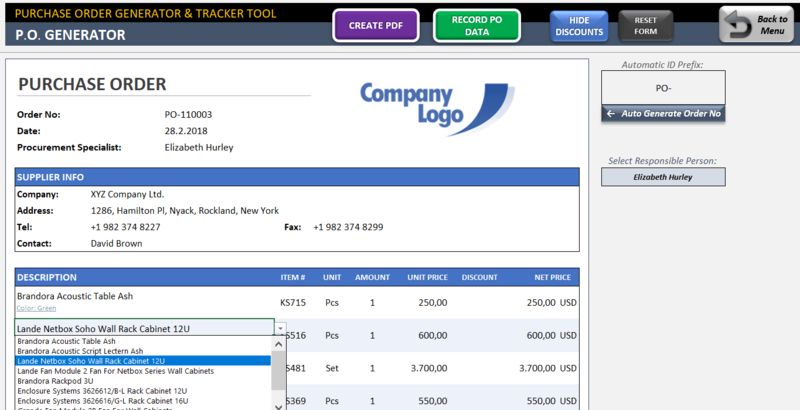 But, we can add a separate “Customers Section” to let the users select from. Its a great template! I just wish there were more than 9 lines for bigger PO’s, and if the template would keep extending as more items were added. Would this be possible? Even to possibly make it two pages to accommodate things like that? 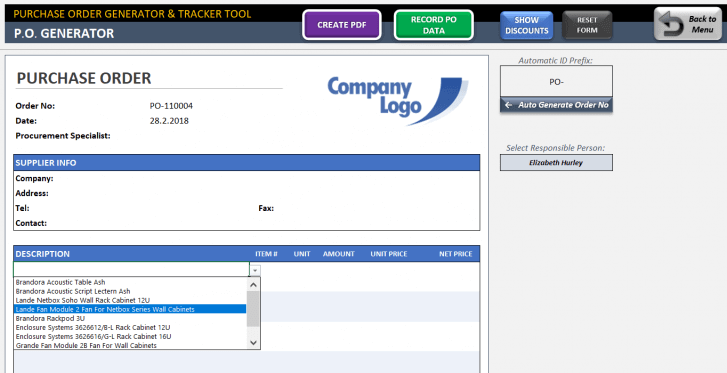 We are planning to add this feature on Purchase Order Generator in near future and will send the updated version to our current users for free! I have been using this template for over a year now. helpful document. looks good but i cant make modification, i wanna set my own color on it. not flexible. How can I change colors?! Hello Ravi! You can easily unprotect the sheet and make any changes you like. Just refer this guide: How can I unlock the sheets? What is the password? Our providers ask us to prepare seperate invoice for each order. it means a lot of work but this template keep us from overtime! Customer service was and is amazing! preparing first document isn’t the easiest. But overall is good. The template looks excellent it’s possible to change the heading/title, and make any further changes! Thx!!! !